What better way to kick off our blog on the first weekend of the summer season but with an homage to summer drinks? 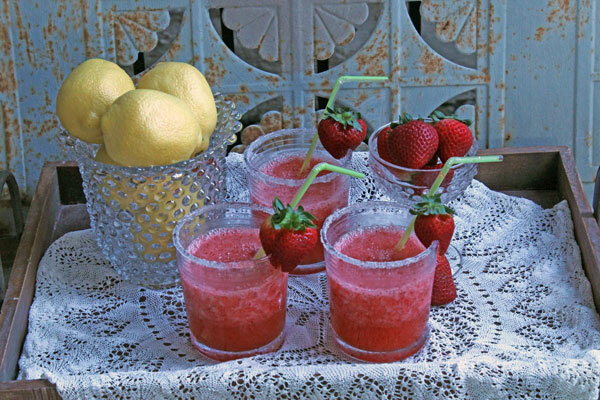 My lovely cousin Jeremy who is an amazing wedding planner in Fort Wayne, IN whipped up these delightful little strawberry margaritas over the weekend. Trust me, they taste as good as they look! Wouldn’t a tray full of these would be prefect for an outdoor cocktail party on a hot summer evening?? Yum. Fill a blender with ice and crush. Add tequila and triple sec. Next add the strawberries and limeaid. Blend for 30 seconds or until smooth. Serve with pretty drinkware and rims dipped in sugar.